DOUBLE A + TRIPLE A TEAMS ONLY - 14th ANNUAL MAYDAY CLASSIC - NO GATE FEES !! Description: 14th Annual MayDay Classic - NO GATE FEES FOR THIS TOURNAMENT. Sells out quick every year. Great tournament of Double A and higher local teams and teams from Ohio and Canada !! All games will be held at Founders Sports Park in Farmington Hills, Michigan which is an awesome facility of 8 diamonds with full concessions and clean bathrooms. 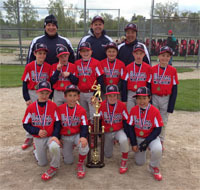 Special Notes: Division winners will win a free paid bid ($125 off world series fee 9u to 13u and $150 off world series fee for 14u to 18u) to the 2019 USA Travel Sports World Series July 19-21, 2019 in Flat Rock, Michigan. Animals, alcohol and tobacco are prohibited. Hotel Booking Requirement for Overnight Teams: A good working relationship with hotels in our tournament destinations is critical for the long-term success of Wolves Tournaments. For this reason, teams who are traveling from out of town are required to book their rooms through our Travel Partner to ensure that our hotel room blocks are utilized since the hotels are holding rooms for our events. The team information page has an area to document hotel information for your team. Teams who choose not to work through this process may be assessed an additional $200 fee by Wolves Tournaments. PLEASE READ THE TOURNAMENT RULES AND INFORMATION PACKET POSTED ONLINE. NO GATE FEES - Tournament sold out last season ! !